I’ve never been a snobby shampoo girl. Face serum? Different story. Ever since my first date with Estée Lauder ANR, snobby skincare girl kicked into action. I've indulged in hair care brands like Bumble and Bumble in the past, hoping that a higher price tag would mean better results. This was back when volumizing products were hard to find at the drugstore, but it still wasn’t worth it most of the time. Now that I push my hair washing to every other day, I'm using shampoo more sparingly and relying on styling products to do the work. Here are some of my favourite products from salon brands that might just pull you away from the drugstore. I’ve recently upgraded from Herbal Essences (which I occasionally still use!) to Klorane, And over the past few months Alterna, Sebastian and Nioxin have found their way into my routine. I like all of their collections, so here are pros and cons from each of the sets, which I’ve tried heavily. Fine, lots of hair. Untreated, straight, considerably limp. Normal scalp type, not too sensitive, but oily on occasion. Buildup of skin cells and clogged pores occur after 3 days of not washing. This was my favourite shampoo in 2017. I like the simple shape of the bottles, and both the shampoo and conditioner work amazing for my basic hair needs. I can use it daily and my scalp will feel comfortable (not overly stripped or still dirty). I’ll admit, I’m not the target audience for Nioxin products. They’re geared towards those with hair loss or thin hair that needs some serious thickening power. I thought there’s nothing to lose in this case, so I still use and enjoy the line. This is the one collection that I notice is almost too moisturizing for me. But dry hair girls and guys - listen in! Nioxin is so freaking smart, their conditioner bottle is smaller than the shampoo. Yes!! I never use a lot of conditioner since my hair isn’t long. The shampoo is blue and minty, it is meant to stimulate the scalp. The conditioner isn’t too rich feeling, but it definitely hangs on to the hair and is supposed to be applied root to tip. I don’t mind this collection as a 1 or 2x weekly treatment to revive dry hair if it needs some TLC. I don’t adore minty shampoos so I won’t repurchase. - Clinical formulation including peppermint oil and cleansing agents to stimulate the scalp. I've been loving the Wella Root Shoot mousse for right after I wash my hair, the Nioxin Dry Cleanser on Day 2, and Alterna's CC Caviar cream for when I need some extra shine and conditioning on my ends. The Caviar Sheer Dry Shampoo is really interesting, it pumps out the dry powder into a puff/cloud that gently sits on the hair for you to massage through. My bottle is finicky so it isn't constantly pumping, but when it does come out evenly, the results are good with no white residue. I'm excited to see how their Hydra-Gelée works to tame my frizz with little to no added weight. If you’re at Sephora, buy Alterna Caviar. If you need hair growth and stimulation, buy Nioxin. If you want a reliable salon brand to leave your hair balanced clean, and nourished, buy Sebastian. You won’t be disappointed. I love the Alterna shampoo! But that price tag.... other expensive shampoos I love include Nexus & IGK! 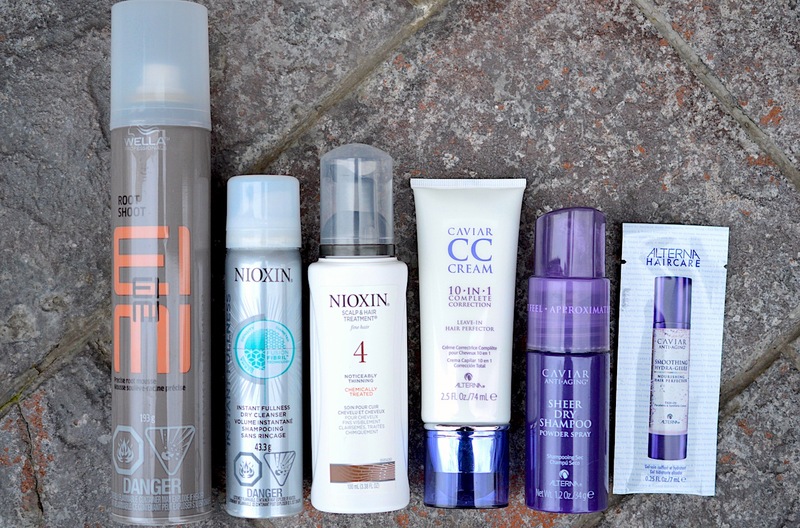 I've always loved Nioxin products - they are a lifesaver for thin, fine hair! And I definitely need to try that Caviar dry shampoo! I hear its a great brand, but I havent tried any of their products! LOVE Alterna Caviar. It's not my daily (I use Joico KPak for colour-preserving), but it's the ONLY thing in my travel bag. I specifically rebuy the Alterna Caviar whenever the travel sizes are in kits at Sephora. I've heard so much about the Caviar line! Hmmm....maybe I'll have to look into it! I notice they have quite a few travel sets which might be nice to try out!